It's not unusual for people (especially name lovers) to name their toys. Sometimes the toymakers give us a helping hand and name their toys for us. It's hard to deny that we feel more emotionally connected to something that has a name, so this is probably a clever way to make us more inclined to buy a particular toy, even if we choose to give our own toys a different name. Despite being an adult, I'm still a sucker for a cute stuffed toy. One brand in particular I love is the Nici brand, after my husband bought me one of their dogs a few years ago (I named him Ralphie because he's just so cute, sweet and innocent looking). 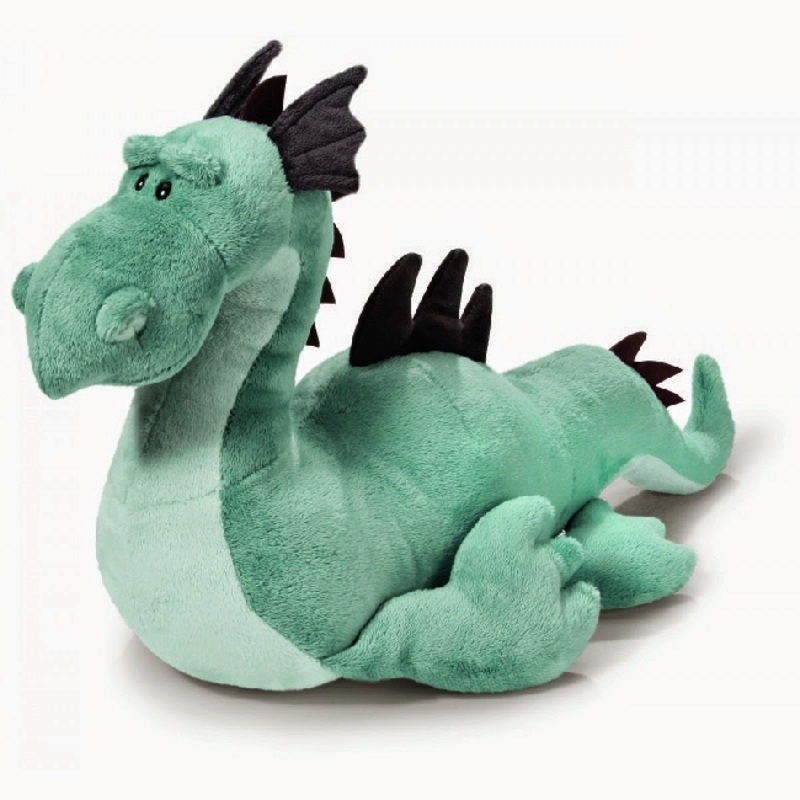 Nici have quite a few ranges, but one I'm particularly in love with at the moment is their range of dragons. All of the Nici dragons have some pretty unusual names, which I'm fairly sure have been invented to sound particularly dragon-ish. They're fiery and macho sounding, reminiscent of the environments in which they live. I'm not sure they'd all make great human names, but they're fun to think about. Arkaai is a new dragon for 2014, a giant blue sea monster who rules the churning waters. To my ears, it sounds like it is composed of the roar a monster would make (Arrrr! ), blended with the word Kai. Kai has different meanings in many languages, but perhaps the most commonly recognised is the Hawaiian (and Japanese) meaning of 'ocean'. There's also the element of 'ark' or 'arka' in there, which is the big ship Noah built to withstand the great flood. So all in all, it feels pretty fitting for a sea monster. Would you use it as a name? Probably not, although drop an "a" and Arkai might be more likely, considering Kai has been on the rise for a few years now. Orange with red wings, Arock is the volcano dragon from the land of Magmania. He also has the "Ar" sound, this time combined with Rock, probably because volcanoes are made of rock. I like it's appearance, and the name in theory, but in practice it's a little difficult to get your tongue around. The sinister dragon from Dragonia, he's dark grey with red wings. There's always something about that "drac" sound that feels vaguely sinister and menacing, isn't there? Think Dracula, or Draco Malfoy from 'Harry Potter'. It's not a coincidence - Drac literally means 'devil' in Romanian, and in Latin it means - funnily enough - 'dragon'. Although Dracon sounds kind of "namey", personally I'd stick with Drake if I was going down this path. He is the blue, ball dragon from Dragonia, and has a quite different look to the other dragons. This is an interesting one, as it seems in earlier press releases he was called Ivan, but when the Magmania dragons were released he was definitely referred to as Iwan. Ivan has never been out of the top 400 for boys in the U.S, and also has a lengthy history of rare use for girls. Iwan however has only ever charted once, in the 50's. In Germanic (where the company Nici is based) and Slavic languages Iwan is pronounced EE-van and is a variant of Ivan, which is a form of the name John. Iwan also has a history as a Welsh and Cornish name, being a variant of Euan, Ewan or Owen, but pronounced EU-wan. One famous bearer is Welsh actor Iwan Rheon, of 'Misfits' and 'Game of Thrones' fame. Not sure who he is? Here's a synopsis from someone who may be his biggest fan. 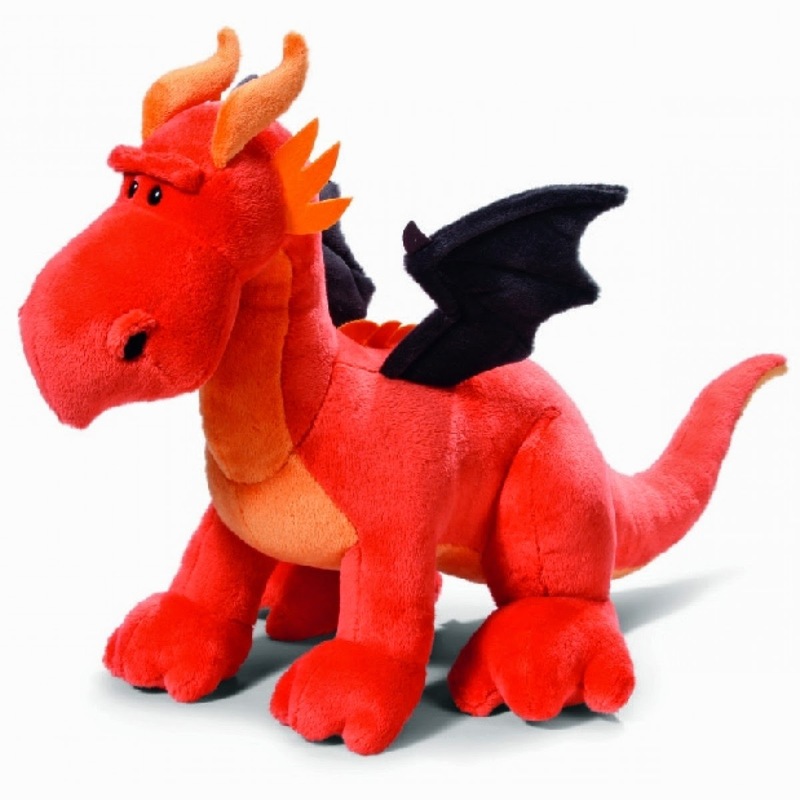 The red fire dragon from Dragonia. I'm not sure where this name came from - it seems it may be a breed of dog, or maybe a surname in some countries. Alternatively, if we follow the logic behind most of the other names on this list, it could be a combination of the name Lando with another growling sound. Lando is a diminutive of Orlando or Rolando, names meaning 'famous throughout the land'. Which Landogar would be, as one of the three ruling dragons of Dragonia. It's a bit much for everyday use, but would feel right at home in a video game or fantasy story. Roorkh is the second new dragon for 2012. Blood red with black wings, he rules the wide sky and rugged lands. Again, it might be my imagination but it seems we have another dragon-like "roor" (or roar) as the basis for this name. It also sounds quite similar to the Irish name Roark, meaning 'illustrious and mighty'. Certainly that would be a good description for such a dragon. I'm not sure about this spelling - I think it was an attempt to distinguish it from the below dragon Thorke. I'd prefer Roark or Roarke, but Roorkh is definitely distinctive and fantasy-like. Thorke is the Green Dragon of Magmania. Besides Iwan, this is the name on the list that I think would work the best on an actual person. It sounds like the kind of name you could expect to see on a daytime soap character. Or maybe a Viking ship. It's likely that Thorke is a variation or Old Norse name Thorkell, or Thor, which mean 'thunder'. Thorke has history as a surname, and is also a character in the Italian comic series 'Dampyr'. That Thorke is a demon of the Black Dimension, giving this name quite a dark edge. I find it a little disappointing that one of the coolest looking dragons has such an obvious and boring name. Twindrak is a blue, two headed dragon from the land of Magmania. Not too hard to see how they came up with this name. I can't ever see this being used for a person, but I guess stranger things have happened.